Welcome to the Tinker bi-plane hanger - get your workbench tidied, put the kettle on and pull up a chair. This is the pace to talk about the build, share pictures and any other information on building tips, modifications & power system etc. If anybody already has the plan for the Tinker and can come up with a wood list that would be a great start! Plan arrived today for Tinker 45" will sort a wood list in the next day or two. Would anyone object if I put a de Havilland tail on mine? Sort of Hornet ish. 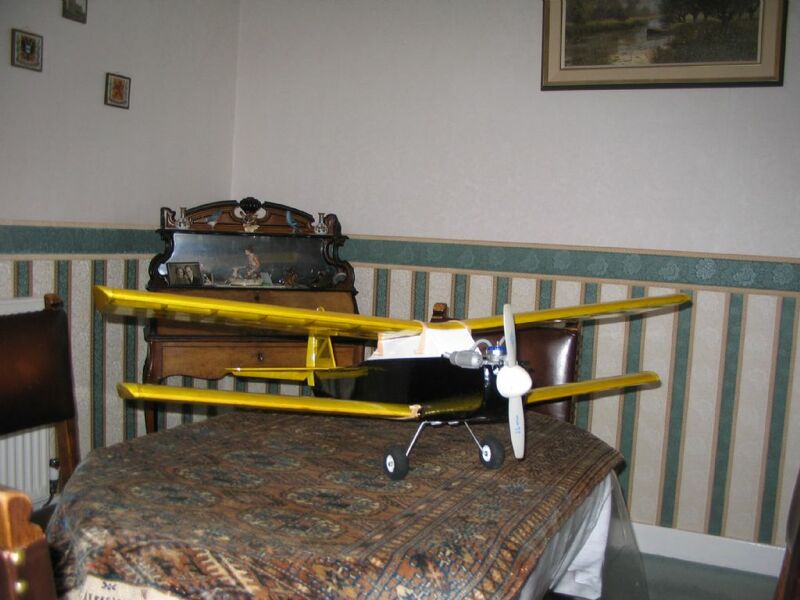 Fancy making a Tinker Biplane, I have one that is nearly 40 year old and still flying. What made you decide on it ? Mine now has a modern 25 in it and can take off in a couple of yards; landing into a slight wind can be nearly vertical with just a little power on. It will turn heads cos it is a bit out of the ordinary and people will say "wor iz it "
Hi Roger, congratulations on keeping your Tinker flying for 40 years! I have been wondering what modern engine might be suitable, it is good to know a 25 will fit - cheers. Ruprect - yes why not, it would look different! Colin - thanks for the video, it is a very interesting to see it put through its paces like that. This virtual hanger is exactly the place to share things like that, I don't intend this to be "my" build blog but a shared collective space for this model as part of the mass build. Of course if you want to start your own build blog then please do so. It used to have an old 19 engine but it died over time. It now has an SC 25 and is most def overpowered. You are limited to the size of fuel tank you can use, so you become quite expert at dead stick landings. It looks quite good just pottering along though. I also built one around 40 years ago with a Fox 15 (about the power of a modern 09), ailerons on the bottom wings & wartime Tiger Moth colour scheme. It flew very well but I eventualy sold it on. Out of interest, what size fuel tank fits? Thanks. Looking at the plan I was thinking I could move the front former forward and use a standard engine mount, thought this might give me room for a 4oz tank, what do you reckon Roger? This will be my second Tinker 40 years apart! Ooh, a Tinker, my first 'proper' model. I built mine about 30 years ago, still have the wings somewhere, but the fuselage is long gone. Mine was powered with an ST23 which had plenty of power for me at the time. Just had a look at the plans, they state a 2oz fuel tank. I am 99% sure I shoehorned a 4oz tank in . It isn't easy to go and have a gander now all sealed in. Plan shows 2oz, which wont last long with a 25 in it, found a 3oz tank which will fit but not if you use the engine bearers. It'd be good to see a Tinker revival. I built my first one in the mid 70's, followed by a further one several years later. My first one was fitted with a Webra .20, which provided a lively performance. A nice steady flyer, the Tinker is capable of quite reasonable aerobatics. With enough rudder throw (no ailerons remember) the Tinker will roll. Ok, a bit barrely maybe, but a roll never the less. Fuel tank again........ thinking back, I found a rectangular 4oz tank and shaved the engine bearers slightly in the tank bay and I could then squeeze it in. IIRC I made the fuel tank from a rectangular Colmans mustard tin with a clunk feed made using a nut & bolt, some brass tube & a certain amount of soldering. Worked a treat but I don't recall the capacity. As a newbie flyer on my first build, who's foamie is electric I don't really want to start with IC until I'm sure I want to "stick around" as it were. Is it likely I can build the Tinker to electric ? Yes you can make it electric - I think I will end up going that way as well.